My son started elementary school today. In Japan the school year begins in April, when the cherry blossoms are supposed to be at their peak (of course this year they are all gone!). I am annoyed at any number of things today ($400 backpack! PTA which assumes mothers don't work! paperwork, paperwork, paperwork!) but there are two things I unequivocally love about Japanese schools: the walk to school (get out that energy so they can learn!) and school lunch. But my kids have so little exposure to what other kids eat. They patently do not believe I ate a peanut butter sandwich, an apple, and a drink box for 6 years. Where's the variety, they ask? So when Jennifer at Jean Little Library posted about this book two weeks ago I need I needed to get it. Also, one of the main themes of my son's Grade 1 social studies curriculum is comparing the lives of children of his age around the world, and other books I have for this are based on comparing schools and homes, so this fit right in with our afterschooling plan. 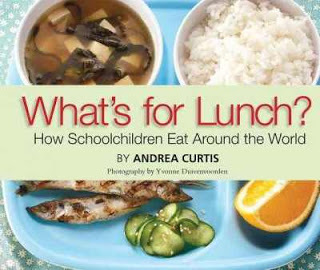 This book is at a lot higher level than I had expected, and there is a lot of information about the politics of school food. Food is political. Religious issues, wealth, and the culture of an area are definitely reflected in school food choices. Whether or not kids even get a school lunch is political (and I honestly do not understand why Canada doesn't have them). My son and I got into a very big discussion about putting whale on the menu in Japan, which is mentioned in the book. It's not a traditional food for most Japanese but it the government wants to make it one to justify some of their whaling actions. What better way than to get kids used to it in elementary school? The photographs are what draws my children's attention the most, and Duivenvoorden has done an amazing job here. Just the photograph of a Brazilian lunch compared to one supplied to refugees in Kenya tells a huge story. We feel very lucky. My kids learned a lot from this book, and so did I! I was surprised to learn that spaghetti is a common Somali dish! There were a couple of issues I had with this book which otherwise is a great resource. Like Jennifer mentioned, not all the foods are identified, and my kids really wanted a couple of recipes to try (or at least know the name of dishes so we could look recipes up). Also the Japanese words do not have a correct guide to pronunciation, with itadakimasu (eat-a-dack-ee-mass), kyushoku (queue-shock-ew), and gochisousama deshita (go-chee-so-sama desh-ta)being somewhat different from actuality. I wonder about the pronunciation of other foreign words in Spanish etc. This post is for Nonfiction Monday, being held today at A Wrung Sponge. This is the thirty-ninth book I have reviewed for the Sixth Canadian Book Challenge. Congratulations on your son starting school. My son started yesterday, too. It's a minefield of paperwork and mind-reading that leaves me feeling quite weary. We haven't had the kyushoku yet and am hoping it's as good as what they served in hoikuen. Some friends have said it's not so good but their kids do go to different schools than my son so fingers crossed. I do love your blog and all the books you review and recommend. This book sounds like a great read and something to keep the kids interested in different cultures. Note to self: must stop by more often! Paperwork and mind-reading is a good way to put it. My poor neighbours are tired of all my questions yet. The benefit of being a bad cook is my kids will love whatever is served at school. ;) Hope yours are delicious. I can`t wait for Noah to be in school and eating kyushoku as he is not the best eater! This looks like a fun non fiction book- I personally am not into non fiction but I love these kind of books for kids and both boys like books with real images/photos I have found! 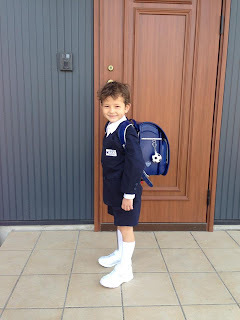 My Son started school this year and it is so exciting, but I also had similar frustrations (lots of unexpected costs!) We don't have school lunches here in Australia, so packing lunches is my new morning ritual. My son asks for Vegemite sandwiches every day! This looks like a really interesting book! This one looks like a winner! I enjoyed reading about your family's experiences and reaction. Great to hear from a family living in Japan with real feedback. 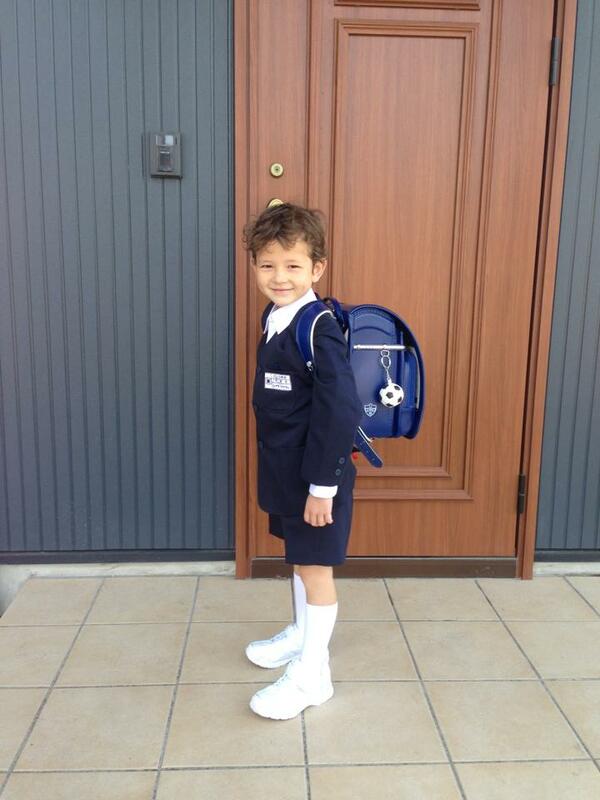 My son just started school as well! I was so happy to see your entries on your afterschool plans because I am currently debating on what to do as well. We just started kyshoku and my son was thrilled with the yakisoba. We'll have to take a look at this book. Thanks for blogging about this.